Many people work in an environment where it’s always hot, no matter what time of year it is. Sometimes a large fan is too bulky for the work place, or there isn’t any room. Arctic Cooling has a solution for just such a problem. 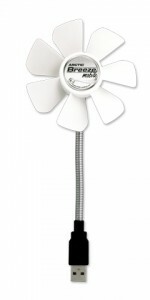 The Arctic Breeze Pro is a USB-powered fan that’s designed for desktop computer users. Plug the fan into an available USB port on your computer, turn the knob, and enjoy the breeze. Fan speed is adjustable, from 800 to 1800 RPM, and the flexible neck enables easy positioning. Four USB ports are conveniently included on the base. For a small fan it’s quite powerful, yet incredibly quiet. I placed it a few feet away from me and still felt the cool air. The attached six foot long power cord allows plenty of placement options; excess cord can be stored underneath the base of the fan. This past summer was especially hot and humid: I wish I had this fan in May! On to the Arctic Breeze Mobile. This fan connects directly into a USB port. Like the Breeze Pro, it has a flexible neck for perfect positioning, and very little noise. The Breeze Mobile is designed for laptop users and/or frequent travelers, but really, anyone would appreciate using this fan. It’s very light and compact, making it a breeze (I know, bad pun) to drop into a backpack or computer bag. While the breeze isn’t as forceful or adjustable as the Breeze Pro, it’s still quite refreshing. 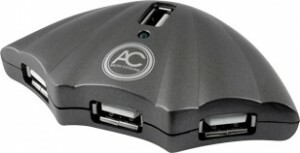 The Arctic USB Hub is the newest product release from Arctic Cooling. Though a USB hub may not be the most exciting device, this one is a little different: it’s shaped like an umbrella, rather than a straight line. Anyone who has had to connect more than one USB device into the side of a computer knows how it can be a little tricky to insert and remove USB cords in such a tight space. The Arctic USB Hub curves in on three sides, like an umbrella, so there’s plenty of room for USB cords. A fourth port is on top of the Hub. The Hub easily recognized everything I threw at it: flash drives, iPhone, iPods and even an iPad. Note that while the iOS devices all synced through the Hub, the iPad is the only one that did not charge. That must be done with either a direct USB connection to the computer or through an electrical outlet. If you just need to sync your iPad, using the Hub works perfectly. The only negative I found with the Arctic USB Hub, which probably isn’t the fault of the Hub, was that portable external hard drives don’t appear on the desktop. The light comes on the drive, that’s it. I’m guessing it’s because portable drives have no power source other than the USB port. Attaching a desktop external hard drive to the Hub, one that uses an electrical cord, was immediately seen by the desktop. In fact, I was able to do a Time Machine back up while I was at it. The Arctic USB Hub weighs next to nothing, making it another Arctic Cooling product that’s perfect for dropping into the computer bag.